Best months to climb: All year round. Best in winter following snow. 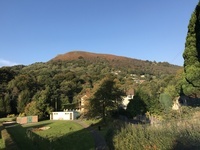 Garth Hill (<b>Garth Mountain, Mynydd y Garth</b> in Welsh) dominates the skyline behind Cardiff and is instantly recognizable by the 5,000 year old tumulus at its highest point. 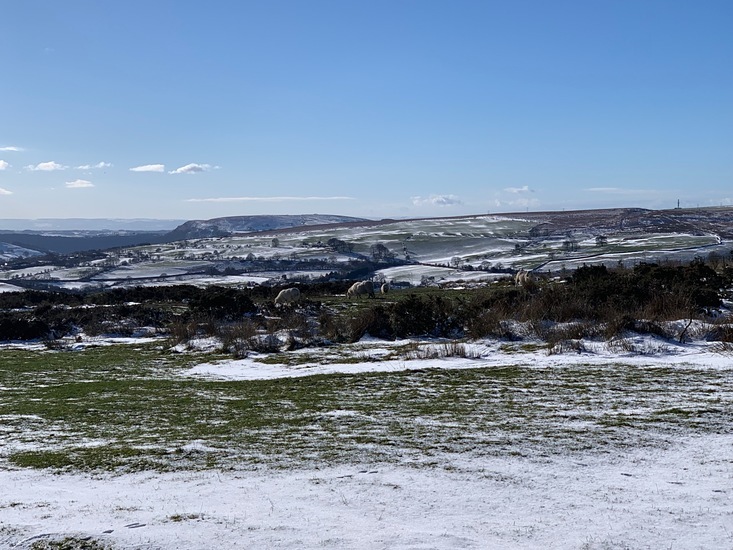 An easy walk up from the village of Pentyrch, or across fields from Efail Isaf, the walker is rewarded with some of the best views in the area: stunning panoramas of the Severn Estuary to the south and the Brecon Beacons to the north. The hill acquired movie fame in film "The Englishman who went up a hill and came down a Mountain" that was based on a story originating in the village of Taff's Well that lies in its shadow. 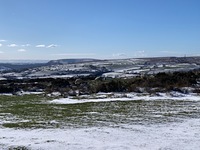 <br> The Garth can be seen near enough all over the Welsh capital city of Cardiff, and on a sunny, clear day as far as Weston-super-Mare across the Bristol Channel in the South West of England. It lies adjacent to the Taff Vale with the village of Pentyrch on one side and looks down onto the small village of Gwaelod-y-Garth. The Garth has a number of tumuli on its top . These date from the early to middle Bronze Age, around 2000 BC. They are burial sites. Fine views of Cardiff and the Taff valley are obtained from the prominent crag visible in the picture . The Garth has a sister hill, the Lesser Garth. The Lesser Garth is of limestone, which is extensively quarried  and was formerly mined for iron ore. 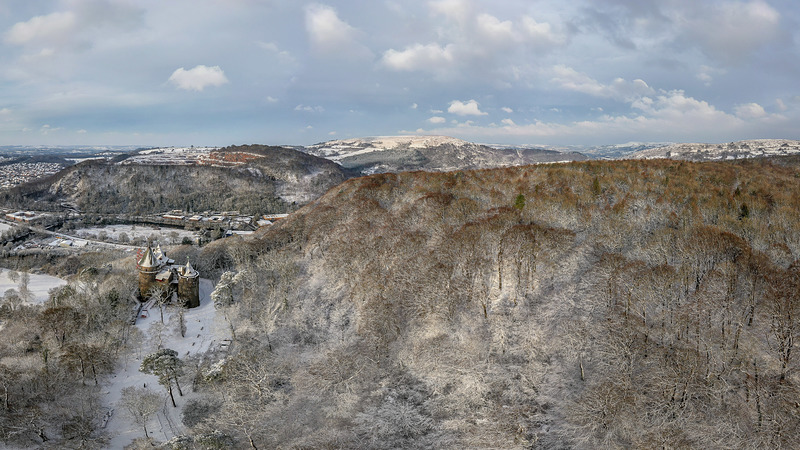 The valley between the two is eroded in softer Coal Measures, shales in the main, while the Garth itself is formed of the resistant Pennant Sandstone formation. Until the 19th century, the valley was full of small coal mines which fed the ironworks below in the River Taff valley, opposite Taff's Well. There is now little trace of these. The access road to Pentyrch village, Heol Goch, runs between the main and lesser Garth. There are several ways to visit this spectacular hill with panoramic views over Cardiff and the Bristol Channel to the south and the Brecon Beacons to the north. The quick and easy way is to park in the lay-by on the Mountain Road just outside Pentyrch and follow the steep tarmac road past the white cottages to the burial mound on the top. This takes 15-20 minutes depending on your fitness. 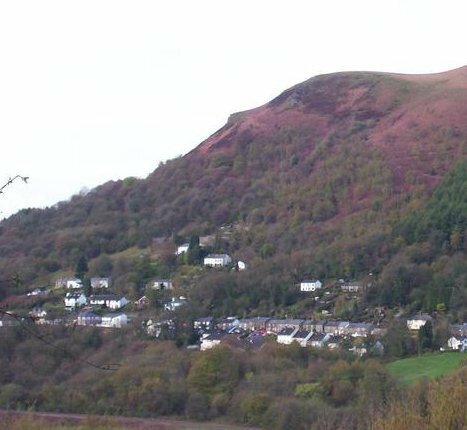 From there you can either walk east along the crest to the other burial sites to the precipitous valley sides overlooking the Taff valley, or just walk back down. For a longer trip, park at the pub in Gwaelod y Garth, follow the steep mountain road and at the hairpin bend(you can't miss it! ), take the footpath into the woods. Look out for a left turn where the trail switches back and leads out of the trees and onto the grassland of Garth. Once up there, take any of the obvious footpaths or sheep trails to the summit. Use this relief map to navigate to mountain peaks in the area of Garth Mountain, Mynydd y Garth.